Last weeks meals went fine... a little out of whack because we went to my parents house to do taxes a few nights... but we still got through most stuff on the list. Here is my plan for this week. Sunday: Soup and Grilled Cheese Sandwiches (still haven't had this in a few weeks - even though its been on the menu EVERY week. Its just the easiest to hold over. I get off the hook pretty easy this week. Which is nice, because I was a little uninspired when planning this. 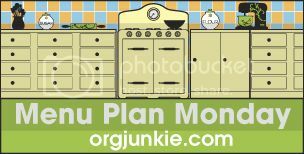 More plans over at Orgjunkie, of course.